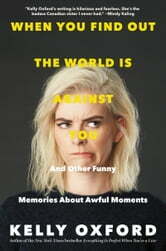 **The author of **the New York Times bestseller Everything Is Perfect When You’re a Liar returns with a deeper and even funnier new collection of essays about the pleasures and perils of living in Kelly Oxford’s head. ** **Kelly Oxford likes to blow up the internet. Whether it is with the kind of Tweets that lead Rolling Stone to name her one of the Funniest People on Twitter or with pictures of her hilariously adorable family (human and animal) or with something much more serious, like creating the hashtag #NotOkay, where millions of women came together to share their stories of sexual assault, Kelly has a unique, razor-sharp perspective on modern life. As a screen writer, professional sh*t disturber, wife and mother of three, Kelly is about everything but the status quo. Perfect for anyone who ever wished David Sedaris and Mindy Kaling would just finally write a book together already, When You Find Out the World is Against You is filled with the biting, wise, and laugh-out-loud insights that have won Kelly legions of fans. Whether she’s detailing her obsession as an eleven-year-old with going to camp so she can become a “kissing bandit,” exploring the bittersweet boredom that so often accompanies parenthood, calling out the insanity of a posse of internet poodle vigilantes, writing bracingly about the anxiety that has plagued her as long as she can remember or taking us to ride shotgun as she stalks her husband on an accidental date with another man, When You Find Out the World Is Against You is Kelly at her most honest and disarmingly funny best. Her comedic skill, down-to-earth voice, and bull’s-eye observations on the absurdity of modern life mean there is nothing quite like seeing the world through Kelly’s eyes.